PLAYING with ten men is becoming all-too-familiar for Hearts. Training with ten isn’t uncommon at Riccarton but Robbie Neilson and Craig Levein couldn’t expect to be a man down in matches this often. Seven red cards have been flashed at Hearts players this season, eight if you include Callum Paterson’s rescinded dismissal. It is beginning to grate with those in charge at Tynecastle. Jordan McGhee is the latest to suffer. His red card at Tannadice on Saturday was viewed as the turning point in Hearts’ 2-1 defeat. It follows hard on the heels of Blazej Augustyn’s dismissal against Hibs last week. Both decisions are considered unjust by the club management but they have no right of appeal as the protagonists were ordered off for two cautions. McGhee was booked for persistent fouling on 35 minutes and referee Kevin Clancy issued him a second yellow card four minutes later. The defender was judged to have fouled the Dundee United forward Edward Ofere, but television replays appeared to show him playing the ball first and fairly. Guy Demel quickly opened the scoring by heading his first United goal, but Jamie Walker’s impressive equaliser looked to have secured a point for the visitors. The ten men couldn’t hang on, though. Paul Paton’s rasping 25-yard drive into the top corner decided the game on 88 minutes and earned the relegation favourites three big points. Some previous red cards this season, such as Juanma’s for headbutting at St Johnstone, were merited. McGhee’s was not, but Hearts have no avenue to seek justice. “It’s happened a couple of times and I don’t want to go into too much detail about it. It is disappointing,” admitted winger Sam Nicholson. “It feels like it’s happened a lot this season but we’ve just got to get on with it. We’ve been down to ten men and still won so we can’t put it down to that. I think the boys gave their all once we went down to ten. We tried to pass it and, in my opinion, we were the better team in the second half. Neilson persisted in speaking to Clancy after the final whistle to register his unhappiness at McGhee’s red card. “It’s a difficult day again for us. We expected to go up there and take three points. We didn’t, so we have to regroup and get ready for next week,” he said. “We went down to ten men and dominated the game. Yes, we got beaten by a wonder goal at the end but the decision with McGhee totally changes the game. “You get a warning, then you get booked, then you go in and make a good tackle and you get a [second] yellow card. I’ve seen again on the video. There are things the referees look at. Is it reckless? Is it endangering? Is it at pace? Are the studs up? It’s none of that. Nothing. He goes in and plays the ball. “That’s the thing that irks you a bit with referees. Key decisions like that, they have to be 100 per cent sure. I spoke to Kevin about it. He wasn’t happy about me speaking but he finally let me in. It’s not going to change the outcome. I just think decisions like that have to be bang on. You have to know that it is a second yellow, and it’s not. It must be said United outplayed their guests in the first half. Their 1-0 interval lead would have been greater but for the defiance of the Hearts goalkeeper Neil Alexander. He denied Ofere, Demel and Ofere again with three vital stops. After McGhee’s dismissal, John Rankin hit a post and Demel headed the opening goal from the resultant corner. Walker’s leveller was an exquisite left-footed finish shortly after the restart. He collected John Souttar’s long ball forward and drove it high beyond Eiji Kawashima into the United net. Hearts scrapped tenaciously throughout the second period and could have taken the lead had striker Abiola Dauda squared to Nicholson instead of shooting on 87 minutes. Just 60 seconds later, Paton produced a stunning winning goal with an unstoppable drive from Henri Anier’s lay-off. Augystyn’s header in stoppage-time was blocked, and Anier found himself red-carded for a late kick at Alim Ozturk. 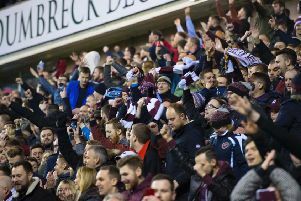 The final whistle brought cheers of relief from the United support, some of whom had ealier unveiled banners with messages of “Thompson out” aimed at chairman Stephen Thompson. His midweek statement labelled the Tannadice players “abysmal” after Tuesday’s 3-0 home loss against Motherwell. This was the perfect response. Gunning was coy on team-mate John Rankin’s comments that some United players had “downed tools”. “I don’t agree with that but I’ve only played ten games so I can’t really say. At the end of the season you get what you deserve. You can’t blame anybody else. You can blame Jackie [McNamara], you can blame the chairman, but at the end of the day it’s the players’ fault if we get relegated. I don’t think we will. Mixu Paatelainen, the Dundee United manager, was keen not to get carried away knowing his team remain 11 points adrift of second-bottom Kilmarnock. “We keep our feet on the ground, it’s just one victory,” he said. “It’s an important one and we take that gladly. We need to be consistent, there’s no question about that, but if we keep that kind of spirit going, there is a possibility we stay up.